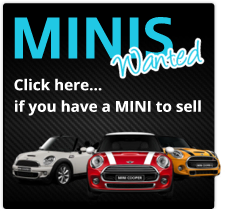 Once you have taken a good look at one of our MINIs, perhaps had a drive in it too, & decided that its the perfect MINI just for you, then to secure it we ask for a 10% deposit. At that point your chosen MINI is then considered a sold car and is no longer available to anyone else to purchase. You have paid a deposit so its taken off the market!! We are a little old fashioned & do not take plastic at all, so no debit or credit cards with us! The reason we don’t take this form of payment, is that its very easy for our younger customers to get swept along with the excitement & emotion of buying a MINI, and we want to make 100% sure that our younger customers appreciate the reality of the purchase they are making, and that it is within their budgets. It is often the first time our younger customers have purchased a car, so we aim to make sure it is a rational & considered decision that is being made, and not one that they later regret. Generally deposits are paid either in cash or occasionally bank to bank. We send you a text to confirm receipt of your deposit, so you know that the funds have reached us safely. All deposits are non refundable, (the reason for this is that we will be taking the MINI off the market, thus potentially turning others who may be interested in it away). By this stage we will have agreed all the details of the sale of your MINI and we will send you, by e-mail a pdf of our invoice. This gives you all the details of your MINI, including its registration number, chassis number, MOT & Tax status, miles and so forth, everything you will need to sort out your insurance. It also give you details of the financials, including the price of your MINI and any extras like stripes, upgraded wheels, bluetooth kits being fitted and so on… You will also see our Bank Account details on our invoice too. We ask that the balance is paid bank to bank and we ask that it clears 48 hours before your intended collection date. That gives us both time to sort out any glitches with the banks before hand, as it can be tricky trying to get hold of the right person in a bank to help at the time of collection, especially if you are collecting your MINI on a Saturday or Sunday. If you tell us when you make the final payment, we will check the funds have arrived and confirm receipt back to you, so that you know the money reached us safely. On the day of collection, your MINI will be waiting for you, she (or he, we do occasionally have male MINIs) will have been valeted, and all the paper work will be ready for you to sign. You will be signing your V5 which we copy then send off to the DVLA, your invoices – there will be two copies of that, one for you and one for us, and your warranty booklet too. Once you have autographed everything, we will re-cap on how everything works on your MINI then hand over the keys. At that point you become the proud owner of your MINI, and we wave you off wishing you many happy miles of motoring together. Paym Payments (Mobile to mobile) available – no cash deposit payment required – please call for details.